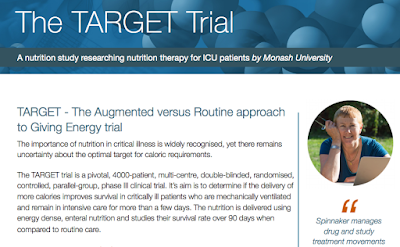 As the TARGET Trial races towards the successful enrolment of its 4,000 patients, we are pleased to publish a case study of our involvement in the project. TARGET involves 46 ICU's in both New Zealand and Australia. The trial commenced in 2016, it has been recruiting at extremely high rates. Enrolments will be completed early, certainly by the end of 2017. With over 100,000 bags of study treatment supplied as part of this trial, some smart stock management was needed. Spinnaker delivered on that. We are very pleased we have been able to help with streamlining the inventory management, delivery, reconciliation and patient allocation right into the CRF. Hopefully making your job easier. You can read the full case study on our trial summary page over on the Spinnaker website. You will also find a PDF of the case study, PDF of the TARGET Fact Sheet and a link to an interview with the Chief Investigator answering questions about the trial.